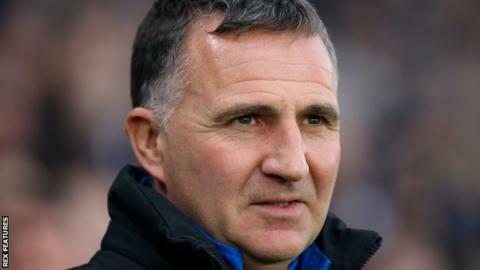 Championship strugglers Wigan Athletic have parted company with boss Warren Joyce after only four months. The Latics lost 1-0 at home to fellow relegation candidates Bristol City on Saturday to leave them four points from safety with nine games remaining. Former Manchester United Under-21 manager Joyce, 52, took over in November after Gary Caldwell's sacking but only won six of 24 games in charge. Assistant manager Graham Barrow will take charge for the rest of the season. "It is unfortunate that we have made this decision but with the team in such a perilous position in the league, we need to act now because we cannot afford to fall any further behind," said chairman David Sharpe. "Results and performances have simply not been up to standard often enough in recent matches. "Although we acknowledge the difficulties faced in managing a team in a league where we are competing against clubs with much larger budgets, the nature of some of our recent defeats, especially against close rivals, has fallen short in terms of what we as a club, and all our supporters, expect." Former Bolton, Preston, Plymouth, Burnley and Hull City midfielder Joyce signed a three-and-a-half-year contract with Wigan, but has left along with first team coach Andy Welsh. After winning the League One title last season, the Latics have struggled in the second tier, and are the lowest scorers, having failed to find the net in 10 of their last 14 home matches. Former Latics captain Barrow, 62, who went on to manage the club from August 1994 to October 1995, returned to the club in 2009 after spells as manager of Chester (twice) and Rochdale to work as part of Roberto Martinez's coaching team. This is his third time in caretaker charge in less than four years. It's not altogether surprising, although it's still something of a shock when it happens. But the record under Warren Joyce has been miserable after the highs of last season when the 'Tics lifted the League One title. Next to bottom, four points from safety, just five wins in 22 league games, and with a dozen defeats tells its own story. Even bottom club Rotherham United have scored more goals. It's been even more painful at home with just one league win at the DW, not even finding the net in eight of the eleven league matches there on his watch. The effort has been there, but the quality of the football has been uninspiring. Maybe it was always the wrong fit. Running a successful production line of young players at Old Trafford doesn't automatically give you the nous to battle it out in with more experienced rivals in football's second tier against more established clubs with largely bigger budgets. Many will now question the wisdom of sacking Gary Caldwell in the autumn, six months after he was crowned League One Manager of the Season in his first year in management. He'd only lost once in his last five games in charge after all.